Haven't made a game in a while and im out of ideas. HALP. As mentioned in the comments for Plarform RC I've been contemplating a series of games based round the wrong Klik & Play movement options. I really like games with awkward controls, or controls that take some learning. A lot of old games seem to work like this, but for some reason mastering their control is approached as a part of mastering the game, rather than as a deficiency in their design. This post is to get the ball rolling, the mind ticking, and to be somewhere to dump ideas. A single-screen racer with eight directions movement. A shooter with race car movement. A breakanoid with race car movement. 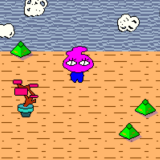 A point-and-click adventure game with platform movement for the cursor. A Joust clone with race car movement. A maze game with bouncing ball movement. Probably any genre with RC movement will work. 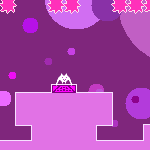 You are most welcome to make suggestions, or use the idea yourself, like EffBee's ace Pretend You're Platforming. I doubt I'm the first to come up with it! space war boxing - thinking of the old 2600 boxing, overhead view, along w/ playing Little Big Planet. What would it feel like to swing big fists? slingshot - I kind of this OLPC Physics Game Jam - which reminds me, I really should use the Java wrapper for Box2D stuff, one of the maintainers of that port was that the game jam, and it would probably be much more solid than my half-assed "engine"
cellular automata system CAoleslaw - SpindlyQ would love love love to see this. atari rips..... - I think this is shorthand for "smash bros w/ atari characters", grabbing the sprites from the game... though the motion and attack forms would be tricky. heatseeker via repositioning? - heatseeker is this old C=64 game I might still do a Java processing or maybe even Batari Basic 2600 port of -- here I'm wondering if KnP could do it. UPDATE Half asleep, I had some more ideas for some of gamebuttons, games where the display and input is all a "normal" HTML pushbutton. Some kind of RTS gaiden, where your the local commander of a base and just have to press a single button when told to to make a unit.